The SuperSix EVO is the best all around road racing bike ever made thanks to its perfect balance of everything it takes to go fast. An absolute rocket on descents thanks to sharp handling geometry and a frame that's stiff, yet compliant in all the right places. The additional control of disc brakes makes it even faster. Serious road racers, or people looking to ride like one. Frame: SuperSix EVO Disc, BallisTec Carbon, Di2 Compatible, SPEED SAVE, PressFit BB30. 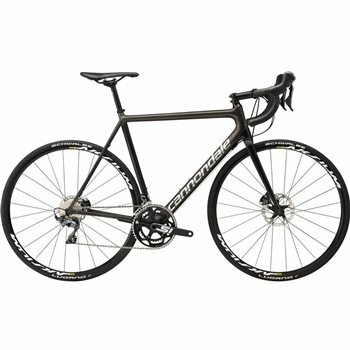 Fork: SuperSix EVO, BallisTec Carbon Disc, SPEED SAVE, 1-1/8" to 1-1/4" steerer, integrated crown race, 100x12mm thru-axle. Hubs: Mavic Aksium Disc Centerlock, 100x12 thru front, 135x9mm QR rear. Tires: Schwalbe Lugano, folding, 700x25c (CE- Mavic Yksion Elite, Folding, 700x25c). Crank: Cannondale Si, BB30a, FSA rings, 52/36 (CE 50/34). Front Derailleur: Shimano Ultegra R8000, braze-on. Shifters: Shimano Ultegra R8020 hydro disc. Handlebar: Cannondale C2, 2014 Alloy, Compact. Grips: Cannondale Bar Tape w/Gel, 3.5mm. Brakes: Shimano Ultegra R8020 hydro disc, flat mount, 160/140mm. Brake Levers: Shimano Ultegra R8020 hydro disc. Military Grade Ballistec Carbon Construction. Vibration damping SAVE Micro Suspension. 25.4mm Seatpost for extra smoothness. TAP Aero Features without the drawbacks.